It's 7:30 a.m., and Brian Kennedy's about to clock out, having successfully driven his spacecraft around Mars four times in the last eight hours. "I just delivered four orbits," he says matter-of-factly. "That's a record for me." Kennedy is one of 11 navigators at JPL who are responsible for the 'round-the-clock guidance of NASA's Mars Odyssey spacecraft through the mission's aerobraking phase - repeatedly flying Odyssey through the top of the martian atmosphere, using friction to lower and circularize the spacecraft's orbit. As Odyssey gets closer to achieving the orbital geometry required for the mission, the end of the delicate, three-month-long aerobraking phase is nearing an end. And Kennedy and his colleagues are looking forward to getting off the graveyard shift: "I'm not going to miss it," he says, having polished off a thermos of coffee and a one-liter bottle of soda to help stay awake, now looking forward to a four-hour nap before eating dinner at noon. With the successful completion of the aerobraking effort, the Odyssey navigation team is leaving a legacy of well-honed interdisciplinary tools and techniques certain to be used on future missions using aerobraking. Aerobraking represents a huge cost savings to space exploration. Instead of using a large amount of propellant to deliver a spacecraft into its final orbit around Mars, aerobraking uses well-controlled "drag passes" through the upper atmosphere to slowly shrink and adjust the altitude of the spacecraft. By not having to carry hundreds of extra kilograms of propellant, the spacecraft is lighter. And a less massive spacecraft can use a smaller, less expensive launch rocket. 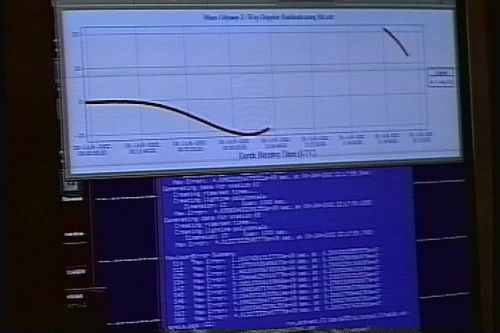 The hardest part is determining where to send the spacecraft on each pass. 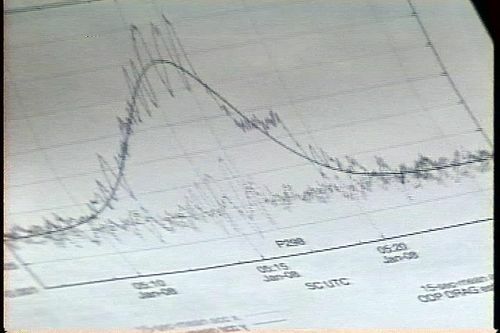 Too low an altitude, and the denser atmosphere could cause parts of the spacecraft to overheat. Too high, and there may not be enough atmosphere there to provide the desired resistance for effective aerobraking. Adding drama to the process, the martian atmosphere is constantly changing in altitude and density. The design of each aerobraking pass is based upon daily weather assessments provided by Odyssey's scientific atmospheric advisory group, which watches Mars weather through Odyssey and another NASA spacecraft - Mars Global Surveyor. Kennedy and his colleagues recall the early days of aerobraking shortly after Odyssey first entered orbit around Mars Oct. 23, 2001. "It was very calm. There would be several hours between drag passes, and we would accumulate several hours of data and deliver it to the operations team at Lockheed Martin in Denver," he recalls. 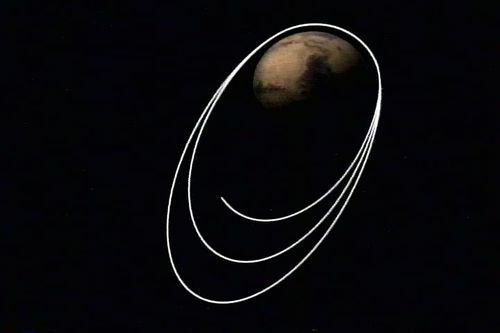 But as the orbit tightened around Mars and the spacecraft has rounded the planet more frequently, the pace has quickened. As time progresses, there has been less time to assemble the results of each drag pass before the next one starts. "It's been getting more interesting," says Kennedy. Odyssey's lead navigator, Bob Mase, says the aerobraking effort has "generally gone better than expected. "The atmosphere did not behave exactly as we predicted, but we were able to compensate for the weather patterns that we experienced. We are actually finishing ahead of schedule, which is better than we anticipated." Challenges along the way included occasional telecommunications outages between Odyssey and NASA' Deep Space Network, when bad weather or other glitches cut off the two-way radio link with the spacecraft. And despite daily reports, Mars' weather created some hurdles, too, says Mase. "We were surprised by the polar vortex that we observed in the atmosphere near the north pole. The atmosphere was very turbulent in that region, but very quiet near the pole. So although we had to slow down to get through the edge of the vortex, we were able to make up time while we were in the quiet polar region." But no matter what problems were thrown at the team, he says, "we were always able to work around them." Odyssey navigator Darren Baird had volunteered for the graveyard shift because of the lonely but challenging learning opportunity it offered. He'll miss the frequent 5 a.m. visits by Odyssey project manager Matt Landano, who'd pop in for early morning updates on the mission's progress. Little perks also made the graveyard shift more easily manageable. "As stupid as this may sound, you're guaranteed a great parking spot" at the sprawling JPL campus, Baird noted. Nonetheless, he looks forward to a return to the sunlit working world so he can resume acquaintances with his girlfriend and family and return to a life of normal sleep cycles. For navigator Peter Antreasian, "the hardest part is going home exhausted at 9 a.m., wanting to sleep, but getting a wide-awake three-year-old jumping on your stomach instead." He described the aerobraking phase as stressful, but well worth the sacrifice. The successful results Odyssey's aerobraking, he says, "have led us to a standard for aerobraking that's going to be pretty commonplace on missions in the future."